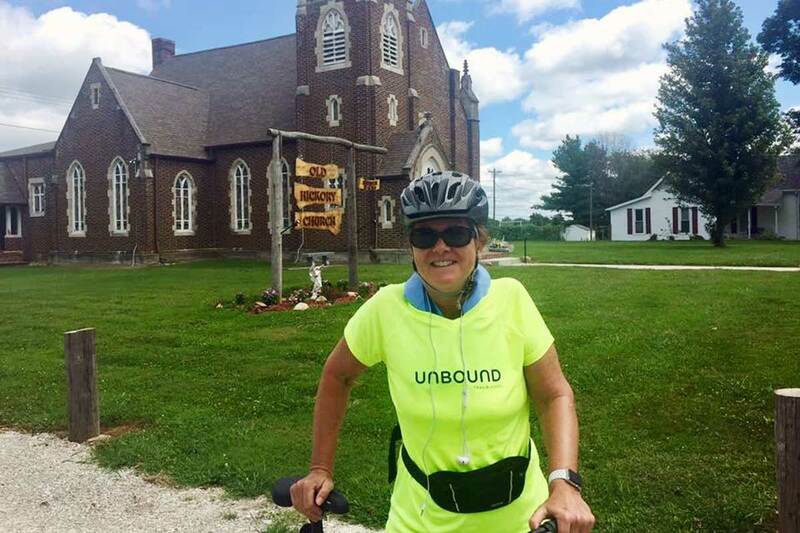 Sponsor Lisa Hendey on the fifth day of the Notre Dame Trail, a 320-mile walking and biking journey in Indiana. When I applied up to be a “core pilgrim” for the Notre Dame Trail, I had no idea how my life would be impacted by the simple act of walking. Having spotted information about the 320-mile pilgrimage being undertaken by my alma mater in honor of the university’s 175th anniversary, I decided to go for it and apply. One special day in the fall of 2016, I received a package letting me know that I’d been selected. Included was an intense training schedule. Suddenly, reality set in: Could I, a 54-year-old non-athlete, be ready to cover that distance in time? In January 2017, early in my training process, I had the good fortune of traveling to India on my second Unbound awareness trip to meet my sponsored elder Lourdhumary. My training “steps” were taken through beautiful India and filled with new and exotic sights and sounds. Shortly after the trip I learned about Unbound’s Trailblazers program and received my first-generation bright yellow Trailblazer shirt. I fell into the habit of wearing that shirt each Tuesday on my “long” walk days. As I put it on and laced up my shoes, I sent prayers for not only Lourdhumary and my sponsored child Jackilyn in the Philippines, but also for all the members of our worldwide Unbound family. My bright Trailblazers shirt got good and sweaty as the weekly miles on foot and bicycle added up. 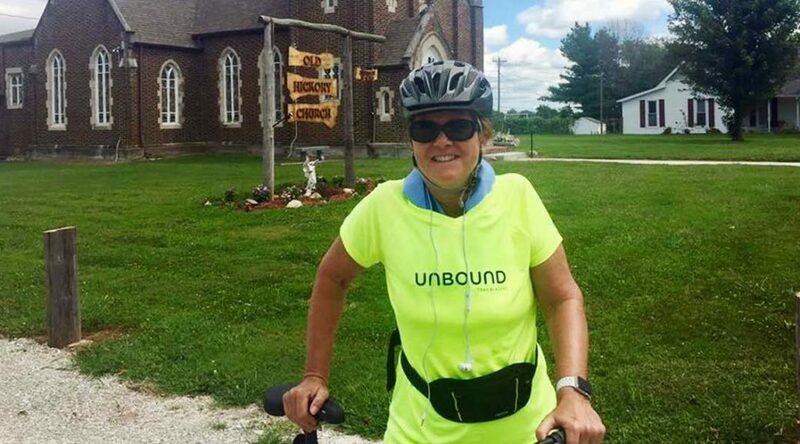 As my mileage mounted, I quickly realized that every time I wore my Unbound shirt in public, I would have many opportunities to share about the gift of being a sponsor. As I grew in confidence along the miles, part of what helped me persevere was my knowledge that, in this very small way, my own life’s path was united with Lourdhumary and Jackilyn and their families. Wherever I walked, I prayed for them and wondered where their steps were taking them that day. Jackilyn is probably walking through the windy streets of her village to school. Lourdhumary is either on her way to the market or off to church, I imagined, picturing the places we’d walked together on my visit to her home. Thoughts of them helped me pass the miles. Whatever small discomfort I felt in pushing myself to keep walking was lessened by remembering those around the world for whom walking is the primary mode of transportation. My steps were a tiny act of solidarity, a reminder to count my blessings as I counted the mileage and to continue pondering ways to lovingly reach out to families around my community and around our world. My training passed in a blur. I learned to love long-walk-Tuesdays as my favorite day of the week. When the moment for our pilgrimage came, packed at the top of my suitcase was that bright yellow shirt, washed so many times and still never dimmed! Along the pilgrimage, my fellow pilgrims asked often about the shirt and always listened with excitement and interest when I shared about Unbound and my sponsored friends. As I walked the last few miles of the Notre Dame Trail in August, I thanked God for all that had been revealed in my life over the months of training. Crossing the finish line, a point of great spiritual significance on the Notre Dame campus, I realized that my life’s walk is truly just beginning. So, every Tuesday, you’ll still spot me with my bright Trailblazer shirt, ready to tell an Unbound story to anyone who asks. Lisa M. Hendey, founder of CatholicMom.com and author of The Grace of Yes, lives and walks in California. Visit her at lisahendey.com.